Without a Truce in Syrian Civil War, U.S.-Led Strikes Threaten More Chaos for World’s Worst Crisis | Democracy Now! StorySep 23, 2014Expanding U.S. 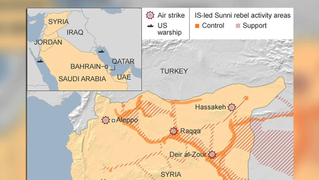 Strikes to ISIS in Syria, Has Obama Opened New Phase of “Perpetual War”? NERMEEN SHAIKH: Pentagon officials are openly acknowledging that the military campaign in Syria and Iraq could take years to succeed. This comes as the latest round of airstrikes in Syria hit targets near the Turkish border close to an area where tens of thousands of Kurds have fled to escape from militants tied to the Islamic State group. On Tuesday, President Obama made his first public remarks about the strikes inside Syria. PRESIDENT BARACK OBAMA: And because of the almost unprecedented effort of this coalition, I think we now have an opportunity to send a very clear message that the world is united, that all of us are committed to making sure that we degrade and ultimately destroy not only ISIL, but also the kinds of extremist ideologies that would lead to so much bloodshed. This is not going to be something that is quick, and it is not something that is going to be easy. It will take time, and it’s not only a military effort. JUAN GONZÁLEZ: President Obama also met on Tuesday with leaders from Saudi Arabia, Iraq, Bahrain, Qatar and the United Arab Emirates in New York. Despite claims that the strikes targeted only militant sites, some residents of Idlib province in Syria said civilian areas had been hit. ABU OSSAMAH: [translated] The military headquarters are far from the city, in the mountains. There are no military headquarters inside the city. All the people who were killed today were displaced civilians from Aleppo fearing the bombs of Bashar al-Assad, the Syrian president. AMY GOODMAN: We go now to London, where we’re joined by Patrick Cockburn, Middle East correspondent for The Independent. His new book is called The Jihadis Return: ISIS and the New Sunni Uprising. Patrick, welcome back to Democracy Now! So, President Obama says we must degrade and destroy the Islamic State. Is this the new line in the sand? Do you see echoes of 2003? Is this going to deal with this violence in the Middle East with this group and the related group, Khorasan? PATRICK COCKBURN: No, it’s not. I mean, it’s—as he said himself, it’s going to take years. But I don’t think it’s going to work. You know, the first day of bombings like this, or bombardments, are usually the best, and there are pictures on television of large buildings being blown up, and it all looks very effective, but usually the buildings have nobody in them. Remember that this didn’t work when the U.S. had 150,000 soldiers in Iraq in 2006 and 2007, so I doubt if it’s going to work now. It’s going to make it more difficult for the Islamic State to put its gunmen into convoys and launch blitzkrieg attacks on bases and on towns, but otherwise it’s not going to have a decisive effect. And you can see that in Iraq, where they’ve been bombing since the beginning of August, and ISIS, the Islamic State, is still on the offensive. AMY GOODMAN: Will it have a recruiting effect? PATRICK COCKBURN: Yes. I think they’re probably not short of recruits anyway. You know, in Iraq and Syria, you have a vast body of unemployed, bitter young men who will look to the Islamic State as somebody who will employ them, somebody who has—shows religious leadership. So, I don’t think that they’ll have any problem with recruitment. NERMEEN SHAIKH: And, Patrick Cockburn, one of the things that’s quite striking about what’s occurred in Syria since the strikes began is that they’re targeting a group, Khorasan, which Obama never mentioned. The focus of the administration has consistently been the Islamic State, or ISIS or ISIL, but the first that we heard of Khorasan was yesterday. Could you explain who this group is and why it is that they are said to constitute a threat to the United States, an argument that has not been made with as much specificity about ISIS? PATRICK COCKBURN: Well, I think that it is a bit mysterious, this group. One’s a little suspicious that the administration, those who are carrying out the bombing, may want to say to its audience in America that here are people we’re attacking who are about to attack you in the homeland, which ISIS didn’t show much sign of doing. So that might be one reason why this obscure group is suddenly given such publicity. AMY GOODMAN: Well, didn’t President Obama need this threat to the so-called homeland, that the criticism when he was attacking ISIS was precisely what you just said, while it might be threatening people there and the region overall, that that wasn’t the justification? And again, following up on that question, who is Khorasan? Who is this group that they’re calling the “al-Qaeda all-stars”? PATRICK COCKBURN: Well, they remain obscure. And also, al-Qaeda is kind of a back number, you know. For years, the administration has gone on, going on about al-Qaeda core, al-Qaeda central, in the mountains of Pakistan, as if this was an influential group. And they had announced great victories over them. Killing bin Laden was one, but also killing officers of this tiny group also in Yemen. But all the time, a much larger group, larger by factors of several hundred, was growing up in Iraq and Syria, which is the Islamic State of Iraq and the Levant. So I think they still rather yearn to connect the jihadi movement to the old al-Qaeda, which was pretty small, just had a few camps, and avoid the much more serious question of confronting the Islamic State, which controls an area larger than Britain, with five or six million people in it. So I think it’s diversionary and an attempt really to show that ISIS is a direct threat to the homeland. NERMEEN SHAIKH: Well, there have even been some reports suggesting that Khorasan is fighting ISIS. I don’t know whether that’s accurate, but it says that—there are some reports that say that the leader of Khorasan had been tasked with fighting ISIS in Syria. PATRICK COCKBURN: Well, he’d have his work cut out. You know, you have Jabhat al-Nusra, which is the official affiliate of al-Qaeda central, so-called, which was originally set up by ISIS and then broke away from it. But that’s been on the retreat. It lost the whole of eastern Syria to ISIS over the summer. It has some strength in Idlib province, and then again in the south near the border with Jordan, but otherwise is very much on the back foot. So, I mean, ISIS holds about one-third of Syria and about one-quarter of Iraq, so to try to equate some tiny group that suddenly emerges with ISIS, I think, is to blur what’s really going on. NERMEEN SHAIKH: I want to turn to comments made by Secretary of State John Kerry. He met with his Iraqi counterpart, Ibrahim al-Jaafari, and Iraqi President Fouad Massoum on Tuesday. Kerry addressed a joint news conference after the meeting. SECRETARY OF STATE JOHN KERRY: I want to just say a few words about our decision to conduct strikes against ISIL targets in Syria and also against seasoned al-Qaeda operatives in Syria who are known as the Khorasan group. We have been very clear from the beginning: We will not allow geography or borders to prevent us from being able to take action against ISIL, and we will not allow them to have a safe haven where they think they can have sanctuary against accountability. We will hold them responsible for their grotesque atrocities, and we will not allow these terrorists to find a safe haven anywhere. That is President Obama’s resolve. If left unchecked, ISIL is not only a threat to the stability of Iraq and to the region, but it is a threat to countries elsewhere, including here. NERMEEN SHAIKH: That was Secretary of State John Kerry. Patrick Cockburn, could you respond to what he said? And also, the argument that you’ve made repeatedly in your pieces is that ISIS, both in Syria and Iraq, given the opposition to the regimes in both those places, may be viewed as the lesser of two evils. PATRICK COCKBURN: By the Sunni community, certainly, it is often regarded as the lesser of two evils. I mean, you know, I have friends in Mosul, which ISIL has controlled for the last three months, and they don’t like ISIS, but they’re truly terrified of the Iraqi army and the Shia militias coming back. The same is true in Syria in towns north of Aleppo that ISIS control and in Raqqa, that they—assuming they’re Sunni. Of course, it’s different if you’re Christian or another religion. If you’re Sunni, then ISIS is difficult to live with, but you stand a better chance of staying alive. And I think that the whole sort of strategy, which has been to try to separate part, at least, of the Sunni community from ISIS by getting the tribes to revolt and so forth, I think, just isn’t going to work. It worked in 2007 in Iraq to a degree, but I don’t think it will work now. ISIS is too big, too violent, and is expecting a stab in the back. AMY GOODMAN: We have to break, but when we come back, Patrick Cockburn, a couple quick questions. Is the U.S. now working with Syria, the country President Obama wanted to bomb—or, destabilize the government of Syria? Is he now working with that country? And also, what about the allies that the U.S. says they are working with, the Arab countries? What are they doing in these airstrikes? Patrick Cockburn is Middle East correspondent for The Independent. His new book, The Jihadis Return: ISIS and the New Sunni Uprising. Stay with us. AMY GOODMAN: “Is It for Freedom,” Sara Thomsen, here on Democracy Now!, democracynow.org, The War and Peace Report. I’m Amy Goodman, with Nermeen Shaikh. NERMEEN SHAIKH: As we continue our conversation on the U.S. military strikes in Syria and Iraq, I want to turn to comments made by the leader of Hezbollah, Hassan Nasrallah. HASSAN NASRALLAH: [translated] We are against American military intervention and international coalition in Syria, whether that action is against the regime, as it was about to happen a year or so ago, or against Islamic State or other. It is a matter of principle. This American administration is not ethically qualified to present itself as a fighter of terrorism or as a leader of an international coalition targeting terrorism. It has nothing to do with fighting terrorism. It has other motivations. This coalition, as Obama declares in all his speeches, is defending American interests. NERMEEN SHAIKH: That was Hezbollah leader Hassan Nasrallah. Patrick Cockburn, could you respond to what he said, and also the suggestion that you’ve made in a recent piece that any prolonged air campaign in Syria by the U.S. and its allies will have to rely on those fighting ISIS on the ground—among them, Hezbollah? PATRICK COCKBURN: Yes. I mean, you know, it’s a very messy situation, because there’s no doubt those who are fighting ISIS in Syria are the Syrian army, Hezbollah, the Syrian Kurds, whose parent organization is labeled as a terrorist by the U.S. and European Union. So, if the U.S. and others are bombing ISIS and trying to degrade, as they say, ISIS, they are obviously helping these groups. Also, at a certain point, if there’s a battle between these two groups, between the Syrian army and ISIS, is the U.S. going to not do anything, or is it going to effectively engage on the side of the Syrian government? So this is an extraordinarily messy situation. I think that Hezbollah is clearly very—and the Syrian government, is very suspicious and wary of what is happening, because if the U.S. can unilaterally bomb Syria against ISIS, it could bomb Syria against them. So, they’re worried about the precedent that’s been set, even though they may be pleased that the U.S. is attacking their main enemy. AMY GOODMAN: And is the U.S. working with President Assad right now, the president of Syria, who President Obama was going to attack last year? We know that they gave them warning, ahead of time, of these bombings. AMY GOODMAN: And the Arab countries they are working with right now, that they say—this kind of coalition of the willing that they have—Saudi Arabia and Qatar, United Arab Emirates and Jordan—in fact, what are they doing? Are they engaging in these strikes? Is the U.S. succeeding in getting Saudi Arabia not to fund ISIS? PATRICK COCKBURN: Well, I think so. I think, you know, all the publicity given that these people are joining in—Jordan may have sent some planes—is, I think, to commit them to being against ISIS very publicly and against jihadis in Syria, when in fact, of course, that they played a role, according to all U.S. inquiries, in funding and setting up these jihadi movements over the last 10 years. However, I do think that they’re genuinely frightened of ISIS, because although they may have had a role in establishing it originally, or the circumstances in which it grew, it’s rather a Frankenstein monster that they don’t control, so I think they are genuinely opposed to it for their own reasons. NERMEEN SHAIKH: Do you think it’s possible, Patrick Cockburn, as some reports have suggested, that in focusing exclusively on these extremist groups and militant groups in Syria, and not on the Assad regime, the moderate rebel groups that the U.S. is supporting may actually be weakened? PATRICK COCKBURN: Well, these moderate groups are a bit difficult to find on the map. And it’s also a question of how moderate are they. There are supposedly going to be 5,000 moderates that are to go to Saudi Arabia to be trained, after they’ve been vetted to show that they are not jihadis. But, you know, they’re not a significant force. I think there’s a sort of pretense that there’s a third force in Syria which could supposedly fight both the Assad government and ISIS simultaneously, but it doesn’t really exist. It’s a political convenience, but really nothing more. AMY GOODMAN: I wanted to turn to Medea Benjamin for a moment. On Tuesday, Democracy Now! spoke to her, the founder of CodePink. She questioned the timing of the strikes on Syria. MEDEA BENJAMIN: Well, isn’t it sad, Amy, that the day that the world should be coming together to say, “How do we address the climate chaos that can really destroy our entire planet?” instead, the eyes will now be on the U.S. bombing campaign in Syria? AMY GOODMAN: That was Medea Benjamin. Your thoughts, Patrick Cockburn? PATRICK COCKBURN: Well, I think that—I doubt it, really. I think that they were always going to do it, because, as the chief of staff, U.S. chief of staff, said, you know, it was absurd to bomb ISIS in Iraq and not in Syria, since they could just disappear across the border and launch offensives there. Secondly, the sort of ritual murder of U.S. journalists and a British aid worker, obviously they felt they had to respond to that. So, I think that there’s probably a simpler explanation as to why they did it now. NERMEEN SHAIKH: One of the problems, before we conclude, Patrick Cockburn, has to do with the anxieties that the Sunni population in both Iraq and Syria feel regarding the Shia governments. To what extent is Iraq’s new government, under Prime Minister Haider al-Abadi, is less sectarian than Nouri al-Maliki’s? PATRICK COCKBURN: It’s less sort of vigorously and aggressively sectarian as Maliki’s government was. But, you know, will this trickle down to the front line? If I’m a Sunni young man in some Sunni village or town outside Fallujah or Mosul, and I’m picked up by the army or by Shia militias, what are my chances of staying alive? What are my chances of not being tortured? Unless it affects that, it’s really not going to change the attitude of the Sunni community in Iraq. And I think that the sort of Sunni leaders who have joined this government, they don’t have much clout within their community. They can’t really go back to their own cities or towns in any safety. AMY GOODMAN: Is President Obama doing just what ISIS asked for—to attack, to engage? PATRICK COCKBURN: I don’t think he’s necessarily fallen into a trap doing that. It’s difficult to know how far—how sophisticated politically ISIS is. After all, it’s a movement which believes it’s inspired by God. It attributed victories over the summer to a divine intervention on its behalf. So it may have overplayed its hand. On the other hand, it can see the advantage of being the standard-bearer of the Muslims, of the Arabs, against what they will describe as crusader intervention. AMY GOODMAN: Patrick Cockburn, if war was not possible, if it was not an option on the table, how could this be resolved diplomatically? PATRICK COCKBURN: Well, I think, that the sort of tremendously messy situation in Syria should be resolved partly by, let’s say, organizing a truce between the Assad government—not a political solution, but a truce—and the non-ISIS opposition, so they can both effectively oppose ISIS. I think that would have an enormous effect. And it could also be an enormous benefit of people able to go back, the millions of Syrians go back to their cities. I think you have to do things at that level, so that there is an effective on-the-ground opposition to ISIS. I think that this present bombing, it looks good for a few days. In some ways, it cramps the style of the ISIS military attacks, but it’s not really going to change anything very much. NERMEEN SHAIKH: Do you think a truce like that is still possible, given that the airstrikes have begun? PATRICK COCKBURN: Between the non-ISIS groups and Damascus, the Syrian army, yes, I think it is, because it sort of exists de facto in many areas already, that both the Assad government and the opposition, the non-ISIS opposition, are susceptible to pressure from the U.S., from Iran, from Russia and Saudi Arabia. You’d have to have pressure for this from the outside, but it could be done, definitely. AMY GOODMAN: Patrick Cockburn, Middle East correspondent for The Independent. His new book, The Jihadis Return: ISIS and the New Sunni Uprising.